Moles have bluish-black to gray fur. Their characteristics are: a slender snout, teeth like needles, flattened feet, claws and small ears. Moles can grow up to 12 inches but this depends on the species. 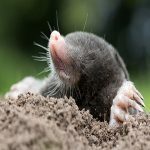 A moles most distinguishing feature is their pointed noses which tells them apart from meadow voles, gophers, and shrews. Their noses extend well in front of their mouths. They have small eyes with ears concealed by fur. A mole has feet shaped like a spade and are wider than they are long. Discharged mounded soil and heaved runways are indicators of the mole’s presence. Diet: Moles have large appetites and may eat up to 100 percent of their body weight in one day. White grubs, earthworms, beetles, and assorted larvae are their principal foods. Moles feed primarily on insects that feed below the ground. Habitat: Mole activity occurs both during the day and night. They can be seen during damp days or the day after a rain during the spring and summer months as they push up the their tunnels or mounds. If the lawn freezes in the winter or there is a very dry summer, the moles use deep burrows. 1) They can pose problems as their molehills become mountains in yards, golf courses and other landscaped areas. As they search for food they kill grass and expensive landscaping plants and shrubs and make the ground uneven and unsightly.